Concentric cracking – The tomato skin splits in circles or semi-circles spanning a portion or the entire circumference of the fruit. Radial cracking – Splits run in straight lines outward from the stem. Splitting or cracking tends to occur when the tomato is nearly mature, and the earlier it happens during the maturation process, the larger the crack will be. Inconsistent watering: The most common cause of splits in tomatoes is heavy rainfall or watering after a period of dryness. Irregularly watered tomato crops are prone to cracking because the sudden excessive moisture makes the inside of the tomato expand, rupturing the outer skin. Temperature fluctuations: Large changes in temperature can cause splitting, especially if leaves are removed from the tomato plants too early so that the fruit is deprived of protection. Alternate heating during the day and cooling at night causes the skin to expand and contract, leading to splits. Improper fertilization: Being low in potassium and high in nitrogen can make tomatoes more prone to cracking, as can overfeeding once tomatoes have begun to ripen. Choose tomato varieties that are less prone to cracking such as Mountain Pride and Mountain Delight – ask experts at your local gardening store about additional crack-resistant varieties. Ensure that plants receive consistent watering and avoid overwatering – water regularly rather than allowing tomato plants to dry out completely and then soaking them. Stop watering and don’t overfeed tomato plants once their fruit begins to ripen. Don’t prune leaves too excessively. Fertilize appropriately for tomatoes – tomato fertilizers should be high in potassium. If growing in a greenhouse, control the temperature as much as possible. Toward the end of the growing season when temperatures begin to cool and heavy rains are more likely, pick fruit early and allow it to ripen indoors. Is It Safe to Eat Split or Cracked Tomatoes? As a general rule, splits or cracks are an aesthetic problem only, and the tomato should be just as tasty as an intact fruit. However, splits expose the tomato flesh to insect pests, diseases, and fungal infections, so split or cracked tomatoes should be picked immediately, as soon as they start to rupture. If a split tomato has sat on the vine for a while, it’s probably best to discard it. If consuming a split tomato, cut out the split area. On a plant where cracking has been a problem, picking under-ripe tomatoes and ripening them indoors is recommended to prevent further splits. Lefroy Valley. (April 2002). “Cracking in Tomatoes.” Grower Solutions Magazine. AgriSupportOnline.com. Royal Horticultural Society. (2009). 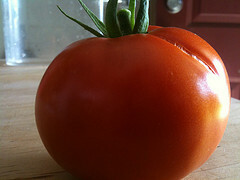 “Tomatoes: Fruit Splitting and Cracking.” RHS.org.uk. Zitter, T.A., & Reiners, S., Cornell University. (May 2004). “Common Tomato Fruit Disorders.” VegetableMDOnline.ppath.cornell.edu.